There are so many sweet treats associated with the holiday season that I occasionally like to come up with some less-sugary options. These pretzel bites might not win a beauty contest but they are so easy – they’re the perfect kid-friendly project and offer up a great sweet-salty-crunchy-chewy taste. It’s a versatile treat too; you can make them with gluten-free pretzels which are now readily available at large grocery stores or health food emporiums. Use your favourite dried fruit, or a combination of several for a more intriguing flavour; you can also use mint chocolate chips if that’s appealing to your tastebuds. 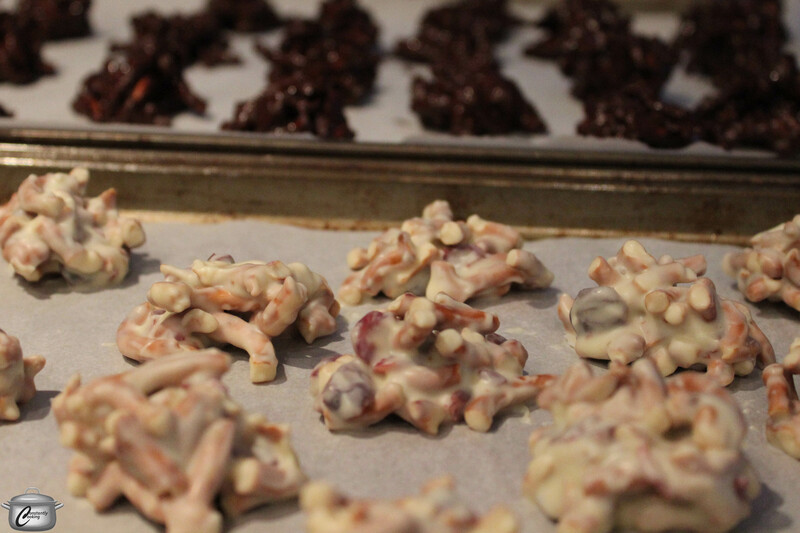 I usually divide the crushed pretzels and fruit in half and melt half-batches of white and dark chocolate so I can package up two kinds of treats together. 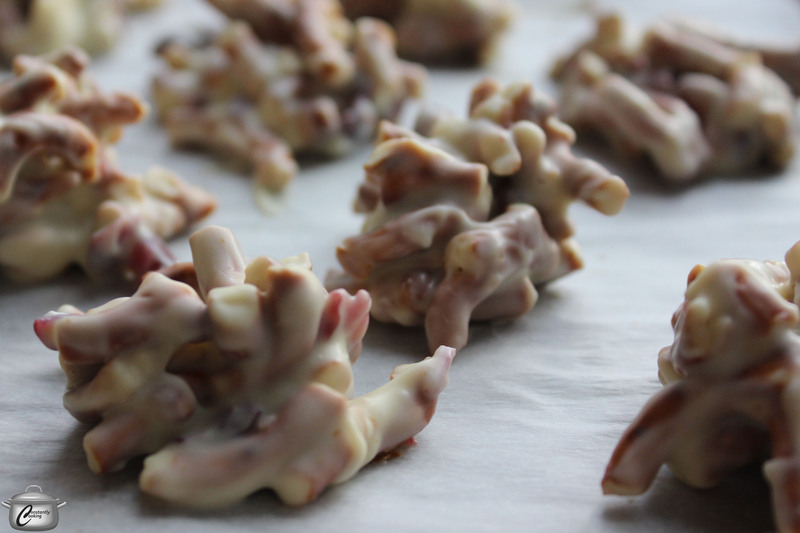 If you enjoy these treats then you are sure to love my salted caramel pretzel bark too. Crunchy, chewy, salty and sweet, these festive pretzel bites are quick and easy to prepare. Put the chocolate in a large heatproof bowl, set over a pan with an inch (2.5 cm) of barely simmering water. Adjust the water level as needed so that the bowl is not touching the water. Leave for a few minutes until the chocolate has melted, stirring occasionally. Alternatively, you can melt the chocolate in a large microwave-safe bowl over medium low heat, stirring every 40 seconds. While chocolate is melting, roughly chop the dried fruit with a sharp knife (you don’t want the pieces too small). Put the pretzels in a clean plastic bag that has a small hole in it to let air out. Place the bag on a cutting board and cover the bag with a tea towel. Gently smash the pretzels with a rolling pin until they’ve broken into small shards around ½ inch (1.25 cm) in size. You want 2 cups of pretzel pieces. Line a baking tray with parchment or waxed paper. Once chocolate has completely melted, stir in the vegetable oil. This will make the chocolate a bit smoother and easier to work with. Stir well to ensure it is well blended. Pour the smashed pretzels into the melted chocolate and mix well. Stir in the raisins, cranberries or cherries. Stir well to blend thoroughly. Working with two spoons, scoop out 1 inch (2.5 cm) portions of the pretzel mixture, placing them on the lined baking sheet. Use white, dark, milk or mint chocolate chips to make your pretzel bites. Let them cool at room temperature until the chocolate has hardened again and the pretzel bites have set (you can speed this process up by putting them in the fridge for a few minutes but don’t leave them too long or the milk/dark chocolate, if using, will turn a bit cloudy). Makes 3 dozen pretzel bites. This entry was posted in Desserts, Edible Gifts and tagged bites, chocolate, dried cherries, dried cranberries, edible gift, festive, gift, gluten-free, handmade, holiday, mint chocolate, pretzel, raisins, treat, vegan, vegetable oil, vegetarian, white chocolate. Bookmark the permalink.